Project obstacles and solutions: Alumni Drive in Lexington, Kentucky is a key thoroughfare to reach several sporting venues on the University of Kentucky campus. 18,000 - 20,000 autos travel on the street daily. The university designed a plan to reroute Alumni Drive around Commonwealth Football Stadium. This $5 million redesign included two roundabouts at intersections on either end of the football stadium. ATS Construction was chosen as the paving contractor for this project. The road was closed for construction on May 10 and the project needed to be completed by August 17 in time for the beginning of school and the football season. ATS needed a concrete mix that was workable with their pavers, but would achieve early strength so construction vehicles could drive on it soon after it was poured. IMI supplied 4,000 psi concrete for the curb and gutter paving, as well as the surface pavement in the roundabouts. IMI QC/QA designed a high slump, Type P concrete mix to achieve early strength. Type P concrete is ready for traffic in 48-72 hours. This was critical on a tight schedule. 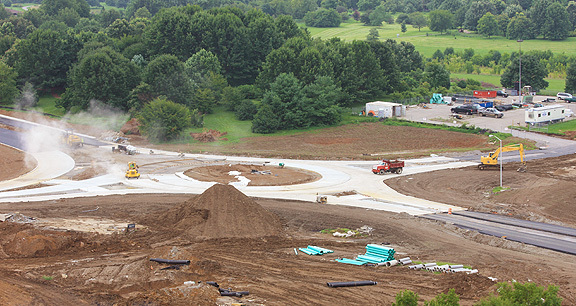 Alumni Drive opened for traffic early on August 17, right on schedule. For more information on paving from IMI, click here.